It has gotten to the stage where Penelope has more toiletries than I do. With the weather getting colder and Penny’s skin being so sensitive I decided to have a clear out. When it comes to skincare I believe that natural products have more advantages to the skin; the less chemicals the better. Penny’s most used skincare products are two products I swear by – Grapeseed Oil and Coconut Oil. They are both incredibly gentle on her delicate skin and perfect for baby massage. Grapeseed oil was recommended to me by my midwife. It’s perfect for softening and moisturising flaky newborn skin and I use Kokoso Organic Coconut Oil (review here) which works wonders on her cradle cap. I was also recently sent several packets of Waterwipes, it didn’t occur to me that baby wipes, a product that we use on her skin day in and day out, may also contain chemicals, preservatives and potential irritants! 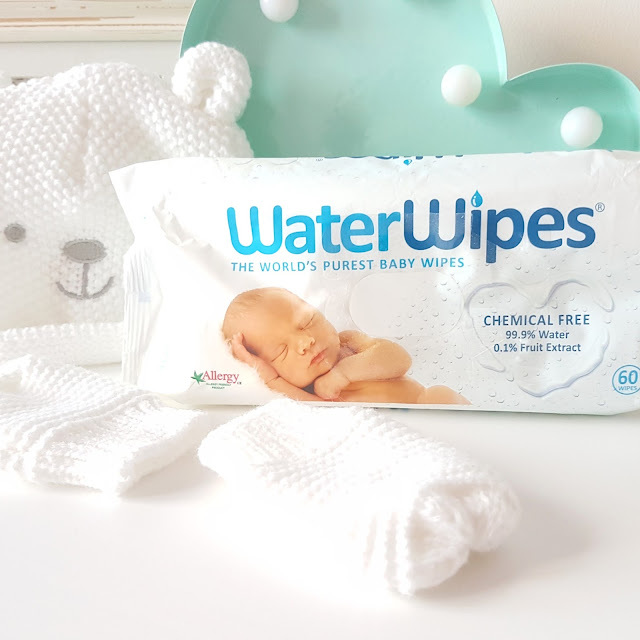 WaterWipes are the world’s purest baby wipes as they contain just two ingredients: 99.9% purified water and 0.1% fruit extract, meaning they are as gentle on her skin as cotton wool and water. Wipes are far more convenient to carry around and a necessity for particularly nasty nappies – you know the ones I’m talking about! As WaterWipes don’t contain preservatives there are few tips you need to know to get the most out of them. They need to be used within 4 weeks of opening, the label needs to be reclosed after every use and, as the water has a tendency to migrate to the bottom, the packet may need to be simply squeezed or turned over when stored. You may think that this is a lot of faffing about, but I don’t think it’s too much to ask for a safer and gentler alternative. The colder months can exacerbate skin conditions due to the addition of central heating, dramatic temperature changes and bundled layers of clothing. 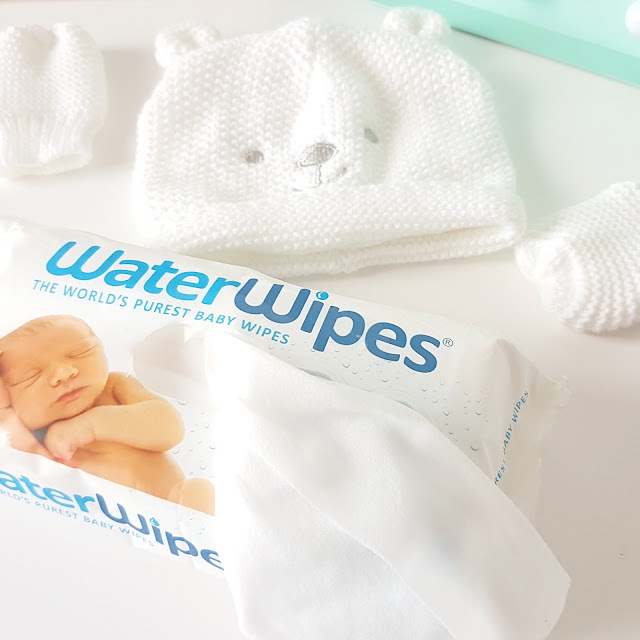 As Waterwipes priority is supporting happy healthy babies they also sent me some useful tips to care for baby’s skin in Winter which I thought I’d share with you. 1. When bathing your baby, ensure the temperature of the room is warm to begin with and avoid hot baths as they can dry your baby’s skin. Try and limit them to five to 10 minutes. 2. Be generous when moisturising your baby using a hypo-allergenic emollient to maintain and protect the natural skin barrier. Coconut oil has also been shown to be an effective natural moisturiser with emollient properties. 3. Between bathing, remember to regularly clean baby dribble or spit up from their neck area and keep this area dry to avoid ‘dribble rash’. Opt for a chemical free baby wipe, such as WaterWipes, made from purified water and grapefruit seed extract, which is renowned for being a natural skin conditioner. 4. Your baby is also much more likely to suffer from dry, chapped lips or sore cheeks as their skin is thinner. Try rubbing a small amount of coconut oil on the baby’s face and lips before going outdoors and try and limit the time they spend outdoors when it’s especially cold. I hope you found this ‘Winter Skin Strategy’ helpful. Obviously reducing exposure to any irritant is a key part of looking after your baby’s skin and if your baby has particularly sensitive skin investing in a pack of WaterWipes may help to effectively clean baby without the need for soap or harsh chemicals. WaterWipes are priced at £2.49 and are available from Boots (here), Amazon.co.uk, Ocado.co.uk and major supermarkets. Do you have any advice/knowledge on caring for baby’s skin? Please share below in the comment section. *This post contains a PR sample or/and gifted item. "Achieve Professional Results with the Beautiful Brows Kit"
"Cosy Autumnal Nights with the Yankee Candle Harvest Time Collection"